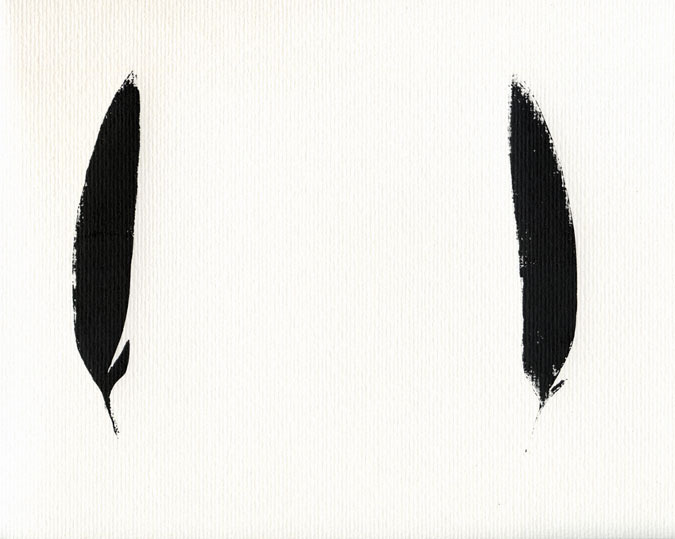 A simple silhouette of a pair of raven feathers. My first Good Screenprint, by which i mean i finally got up the nerve to use watercolour paper instead of cheap copy paper. Some of my copy-paper prints could maybe count as ‘good’ but the paper didn’t hold the ink very well. I’m already ‘upgrading’ from the cheap equipment the screenprinting kit came with, i went to the auto paint store a few days ago and picked up a better squeegee. The kit one was okay but it only really fits the frame in one direction and printing seems to come out better if i can work the ink in multiple directions. And i have so many ideas which need more ink-colours. My screenprinting goal is to eventually have a line of t-shirts. Which, i suppose, means i also need to get my hands on some shirts.